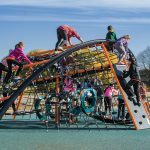 Landscape Structures new Crab Trap™ design is a dynamic and unique net focused playground structure. The inviting Crab Trap™ uses a variety of materials to add visual interest and create different climbing experiences, inside and out. Kids decide how to maneuver from one challenge to the next, for open-ended play experiences that excite creativity and critical decision-making play. I read this article and found it very interesting, thought it might be something for you. The article is called Landscape Structures new Crab Trap™ net designed playsystem and is located at https://www.rossrec.com/products/new-products/landscape-structures-crab-trap/.